The 12B450 loudspeaker is combining very good linearity and efficiency with high power handling capabilities, with use of 77 mm aluminium voice coil. It features vented aluminium die cast frame, 180 mm magnet structure and curvilinear paper cone. 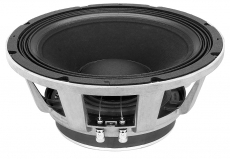 12B450 is suitable for application as LF driver in small stage monitors and 2- way PA boxes with 1`` HF driver. EBP bigger 192!